You can find cartoonist Rube Goldberg’s name in the dictionary. Merriam-Webster defines Rube Goldberg as “accomplishing by complex means what seemingly could be done simply.” A Rube Goldberg object might be a gadget that includes hundreds of unnecessary parts. The cartoonist’s name has become synonymous with the concept, and Rube Goldberg contraptions can be found in movies such as Chitty Chitty Bang Bang, Flubber, Back to the Future and more. On Oct. 12, The Art of Rube Goldberg exhibit will open at the National Museum of American Jewish History (NMAJH). It is the first comprehensive retrospective exhibit of Goldberg’s work since 1970. The exhibit will be up through Jan. 21. On Nov. 6, the museum is also offering free admission in honor of Election Day. The nationally touring exhibit came out of a coffee table book called The Art of Rube Goldberg, said Jennifer George, Goldberg’s granddaughter who put the book together. 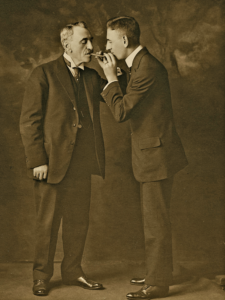 Rube Goldberg (right) with father, Max Goldberg | Artwork Copyright © Rube Goldberg Inc. Throughout much of the 20th century, Goldberg’s art touched on fashion, sports, gender and politics. His extensive career began in the “funnies,” then expanded into political cartoons and even film. Perhaps most of all, he is known for the overly elaborate inventions in some of his work, which satirized society’s increasing reliance on technology. Goldberg was born in San Francisco to Jewish immigrant parents in 1883. At the encouragement of his father, he got a degree in engineering from the University of California, Berkeley. After six months of working as a engineer, he quit his job and started creating sports cartoons for the San Francisco Chronicle. A year later, he moved to New York City, where he worked as a cartoonist and soon became syndicated. In the 1920s and ’30s, Goldberg rose in prominence and became a household name. NMAJH will provide opportunities for interactive learning alongside the exhibit. The museum will have a play area where visitors of all ages can create their own Rube Goldberg machines and do hands-on learning of some building concepts, such as wedges, levers and pulleys. In addition, NMAJH will host the Rube Goldberg Machine Contest in December, where students can invent and submit complicated inventions that accomplish simple tasks. High school students can register for the NMAJH contest at rubegoldberg.comuntil Nov. 9. “The sense of exploration, the sense of innovation that was part of [Goldberg’s] work and the sense of humor are all present in our presentation of the exhibit,” Perelman said. In 1930, Goldberg also delved into the world of film with his movie Soup to Nuts, starring the Three Stooges. Charlie Chaplin’s 1936 Modern Times also includes a nod to Goldberg’s cartoons with the self-operating napkin sequence. During World War II, Goldberg started creating political cartoons, some of which took on Nazism and fascism. His work earned him the ire of some in the United States, who sent him death threats and hate mail, including copies of his own cartoons smeared with feces. The hatred he received was such that he asked his sons to change their last names, so they wouldn’t be associated with him and wouldn’t be seen as Jewish. His sons did so, and the family name changed from Goldberg to George. Goldberg continued in political cartoons after the war. Some of that work could have been created today, including an editorial comic called “Peace Today,” where a house sits on an atomic bomb balancing on the edge of a cliff between world control and world destruction. “Peace Today” won him a Pulitzer Prize in 1948.